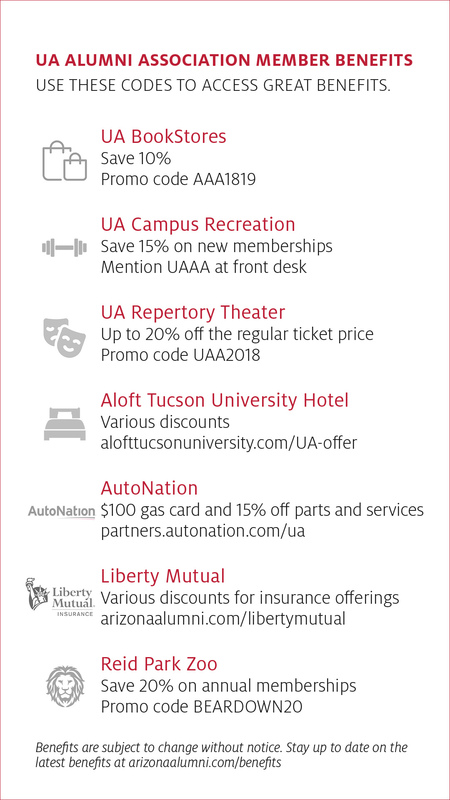 All University of Arizona alumni are general members of the Alumni Association and receive access to great benefits, discounts and special offers listed below. Alumni and supporters who make a gift through membership are sustaining members and receive a decal, mailing labels and three issues of Arizona Alumni Magazine a year in addition to the benefits available to general members. Click here and save this image to your phone or download it and print it out. *Show this image at the front desk at Campus Recreation to receive your discount. Learn more about your benefits for all alumni and how to access them below. Sustaining members receive three print editions of the official magazine for UA alumni. All alumni and international sustaining members can search the online archives for past issues or read the magazine at arizonaalumni.com/magazine. Receive the monthly member-only enewsletter with campus news, alumni updates, trivia and benefit highlights. Available for sustaining members only. See tomorrow’s stars today! UA employees and alumni save on musicals and plays at the UA School of Theatre, Film & Television Arizona Repertory Theatre. Save approximately 20% on performance tickets using the promo code: UAA2018. Work out at one of the nation's top collegiate recreation facilities. Alumni Association members joining Campus Rec for the first time can enjoy 15% OFF the Annual, Annual Plus or Off-Peak memberships. Click here and show this image or show your sustaining membership card to the person at the front desk when purchasing your new membership. For more information about Campus Rec memberships, visit rec.arizona.edu/memberships. Note: This code may not be used on semester memberships. Renewing Campus Rec members are not eligible for the discount. Save 10% online with code AAA1819 or visit any UA BookStores location and show this image. Additionally, receive alumni pricing on Apple® products with your graduation year or UA Alumni Association sustaining member ID. Buy UA for UA at UA BookStores — all purchases support student success. Some restrictions apply. Offer valid July 1, 2018–June 30, 2019. Be part of the first group of people we invite to select events across the world — networking, UA speakers, UA sports viewing parties, career fairs, fundraisers, chapter and club events and more. Don’t be left out. Reid Park Zoo is home to over 350 animals and is committed to conservation and education. Memberships to Reid Park Zoo cover daily admission for 12 months along with many other benefits. Enjoy 20% off any 1-year membership with code BEARDOWN20. Take advantage of AutoNation's exclusive UA alumni perks and SAVE BIG. Receive a $100 gas card and 15% OFF Parts and Service when you purchase or lease a vehicle. UA alumni could save even more on auto insurance with a special discount from GEICO! Visit geico.com/alum/arizona, call 1-800-368-2734 or visit a local office to see how much more you could save today! When you stay at Aloft Tucson University, you're in perfect proximity to campus and a variety of fun things to do nearby. Now for a limited time, Aloft invites you to enjoy exclusive low rates as alumni, students, family members of a student or a staff members at the University of Arizona.